Marco McCullough will fight for the IBF European super-featherweight title at the Ulster Hall on May 17. 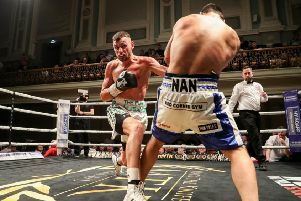 The Belfast fighter will clash with Dublin’s Declan Geraghty for the IBF belt as the main fight on a packed card at the Belfast venue. MTK Global Professional Development Coordinator Jamie Conlan said: “This is fantastic news for MTK Global, for ESPN+, for iFL TV and for the city of Belfast. “We saw in the Cummings versus Keeler fight the special atmosphere that the Ulster Hall can produce. In Marco against Deco, you have a genuine 50-50 title fight and I think we’ll see (and hear) a similar cauldron-like environment to the one we witnessed with Cummings against Keeler. Further news of fighters and fights added to this historic show will be released shortly.